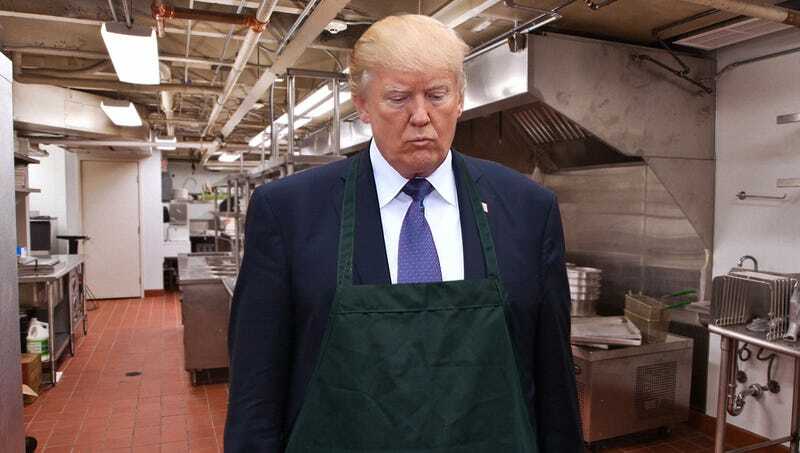 WASHINGTON—Feeling devastated by the thought that he could no longer provide assistance to millions of disadvantaged Americans, a tearful President Trump reportedly put down his ladle Tuesday and walked out of a soup kitchen after learning that the Donald J. Trump Foundation was shutting down. “There was so much I could have done to help those in need, but now it’s just not going to happen,” said a visibly distressed Trump who, upon being informed of the philanthropic organization’s closure, solemnly dumped a kettle filled with hot stew into the garbage several minutes before the start of the meal service. “I think of all the sick, the poor, and the disabled who will suffer because of the federal laws my charitable organization violated and, Jesus, it just breaks my heart. Those beautiful, wonderful souls—God, I can’t bear it.” At press time, Trump took one last heartbreaking look at the line of homeless men, women, and children as he exited the building before collapsing to his knees and crying.